As I write this, winter is now officially just six days away from starting. That means, a number of climbers are preparing to depart to the Karakoram and Himalaya to take on some big peaks during the coldest, most challenging season of all. But not every winter expedition is taking place in those two mountain ranges this year, as Lonnie Dupre has once again returned to Alaska, where he's now gearing up for the start of his latest attempt to climb Denali in January. Lonnie updated his website over the weekend with a dispatch indicating that he had arrived in Talkeetna, with all of his gear for the expedition. He had hoped to fly out to the mountain today, so he could begin getting settled in Base Camp, but the weather forecasts indicate freezing rain throughout the area for the next several days. So, for now, he'll sit and wait for the skies to clear before he catches his flight out to the Alaskan wilderness. This will be Dupre's fourth attempt to climb Denali in January. The mountain has seen 16 total summits in winter, with just three of those coming during the coldest month of them all. Of those 16 summits, 6 perished on the descent, which gives you a sense of how dangerous Denali can be during the winter season. Lonnie expects temperatures to fall below -60ºF/-51ºC, with winds howling at speeds in excess of 100 mph (160 km/h). Heavy snow, whiteout conditions, and avalanches are not uncommon either, with the weather being the number one cause of the failure of his previous attempts. In the past, Lonnie has attempted to climb Denali with the use of tents. Instead, he would dig a series of snow caves up the mountain, which would become his home during the expedition. This time out, he'll be carrying a small tent with him as well, giving him the opportunity to use it as an emergency shelter should the need arise. As with all previous attempts on the mountain in January, he'll also wait until the start of the new year before launching the climb. Any extra time he has on the mountain before that will be spend organizing gear, scouting the route, and acclimatizing to both the weather and altitude. At 6168 meters (20,237 ft), Denali – aka Mt. 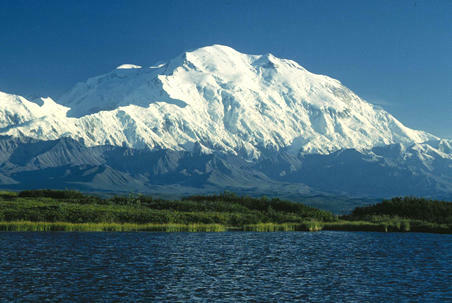 McKinley – is the tallest mountain in North America. It is a technically difficult peak to climb, with unpredictable weather all year round. Because it sits at an extreme latitude, the air pressure is higher on Denali as well, making it seem that the mountain is actually taller than it really is. It's 5486 meter (18,000 ft) prominence is greater than any other mountain on the planet as well. Over the next few weeks, I'll be sharing updates on Lonnie's progress, and we'll be watching his expedition closely throughout the month of January. Hopefully this time luck will be on his side, and the weather will cooperate for once. That hasn't been the case on previous attempts, but the polar explorer/mountaineer seems optimistic that he can complete the expedition this time out. We'll soon find out if that is true. Happy Holidays From The Adventure Blog! Kilian Jornet Sets New Speed Record on Aconcagua! Winter Climbs 2014-2015: The Season is Underway! Video: The Most Insane Ski Line Ever!